Super welterweight world champion Erislandy “The American Dream” Lara (21-2-2, 12 KOs) and former world champion Jan Zaveck (35-3, 19 KOs) took part in a press conference Monday afternoon in Miami as they near their Premier Boxing Champions on ESPN showdown taking place Wednesday, November 25 from Hialeah Park Racing & Casino. PBC on ESPN coverage begins at 8 p.m. ET/5 p.m. PT with undefeated prospect Emmanuel Rodriguez (13-0, 9 KOs) taking on Elicer Aquino (17-1-1, 11 KOs) in bantamweight action. Tickets for the live event, which is promoted by Warriors Boxing, are priced at $100, $75, $50, $35 and $25, not including applicable fees, and are on sale now. Tickets can be purchased online at www.myticketforce.com, by phone at (877) 840-0457 or at the Hialeah Park casino cage. “I’ve worked very hard for this fight. I’ve concentrated very hard during training camp because I know how difficult this fight will be. There’s not much to say now, I’m just thinking about making weight and getting in the ring. “I’m thrilled to be here in south Florida fighting in front of these great fans. I’m happy to fight for the Cubans and show that we have great boxing fans. “Zaveck has fought some of the best boxers in the world and I have great respect for him. I’m totally concentrated on my opponent and I want to continue to prove that I am the best 154-pounder in the world. 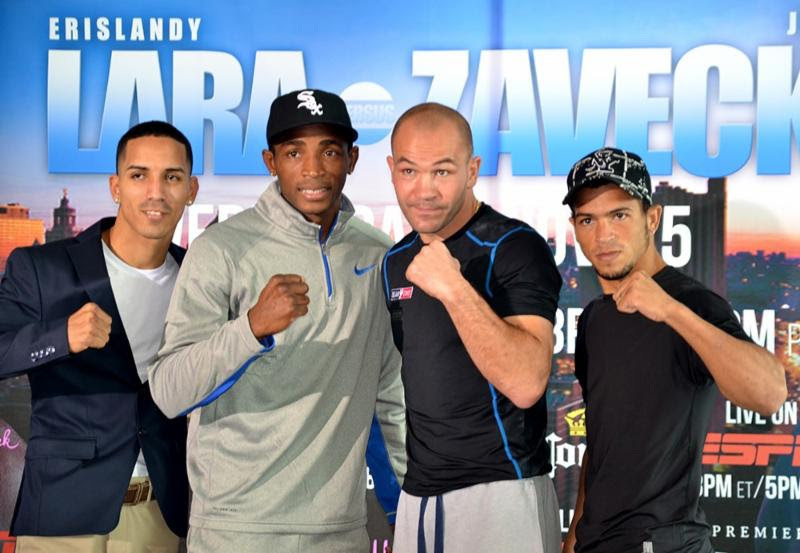 “I’m excited to get in the ring and challenge a brilliant champion like Erislandy Lara. I very satisfied with the condition I’m in entering this fight. “We’re going to show everything we have on Wednesday night and give a great performance. I like Lara as a person and a boxer. Outside of the ring we can be respectful because in the ring we will try to take everything from each other.